Browse: Home / Veterans into Bee Farming. This year’s beginners beekeeping course run at the Help For Heroes centre at Tidworth included consideration of beekeeping as a source of income. The course, now in its third year, is run by BFA member and former army officer, John Geden, who owns Sinah Common Honey in Hampshire. John gives his time freely to run the course which is held over a total of four days at the picturesque Tedworth House in the Wiltshire town. The course comprises three days of theory and one day’s practical training and this year it was attended by 13 students from across all three services. Many have already transitioned into civilian life, but a few are still serving members of our armed forces and several expressed an interest in bee farming. Margaret Ginman, the BFA general secretary, spoke to the course and explained the difference between keeping bees, and bees keeping you! An explanation of the BFA apprentice scheme stimulated some interesting discussion and future consideration may be given to a bespoke scheme for ex-service personnel linked to funding from military and veterans charities. Margaret spoke of the loneliness suffered by some bee farmers and the efforts that the BFA have made to address this issue by working in partnership with ……. Many bee farmers find unique ways to avoid isolation and John Geden has a novel approach. John said “having been diagnosed with PTSD myself and the resultant periods depression and anxiety that this can cause, I realised that I needed to have people around me, it was part of the bee farming job that my family were most concerned about. So every year I run courses locally for new beekeepers and I extend an open offer to the students to take a day off away from the pressures of their working lives and to spend a day with me. That could be just scorching brood boxes or clearing an apiary site in the winter months to handling bees, raising nucleus or queen rearing during the main season. Many veterans suffer from long lasting and often life-changing physical and mental injuries and this was very evident within the group of students. 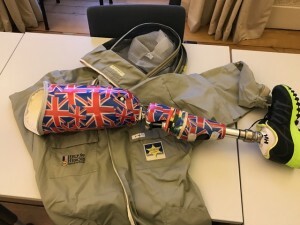 Amputees pose some unique challenges when considering protective clothing and the beekeeping programme has been supported over the last three years by UK based bee suit manufacturer BJ Sherriff. Over the course of a year the team at the Falmouth based company worked with Help for Heroes to develop a modular bee suit that can be fitted to a range of prosthetic limbs and afford maximum protection. Director of the company Angela Sherriff said: “It is a great privilege to work with such a worthwhile charity and we now feel that our modular bee-suit will provide maximum protection for prosthetic users who wish to enjoy beekeeping no matter their background”. The course was specifically written by John and follows the chapters of the BBKA publication Guide to Beekeeping written by Ivor Davis and Roger Cullen Kenyon. The BBKA have also stepped up to support the programme by donating a free copy of the book to each student.